Seemingly the simplest of stories—a passing anecdote of village life— Rock Crystal opens up into a tale of almost unendurable suspense. This jewel-like novella by the writer that Thomas Mann praised as "one of the most extraordinary, the most enigmatic, the most secretly daring and the most strangely gripping narrators in world literature" is among the most unusual, movingSeemingly the simplest of stories—a passing anecdote of village life— Rock Crystal opens up into a tale of almost unendurable suspense. This jewel-like novella by the writer that Thomas Mann praised as "one of the most extraordinary, the most enigmatic, the most secretly daring and the most strangely gripping narrators in world literature" is among the most unusual, moving, and memorable of Christmas stories. Two children—Conrad and his little sister, Sanna—set out from their village high up in the Alps to visit their grandparents in the neighboring valley. It is the day before Christmas but the weather is mild, though of course night falls early in December and the children are warned not to linger. The grandparents welcome the children with presents and pack them off with kisses. Then snow begins to fall, ever more thickly and steadily. Undaunted, the children press on, only to take a wrong turn. The snow rises higher and higher, time passes: it is deep night when the sky clears and Conrad and Sanna discover themselves out on a glacier, terrifying and beautiful, the heart of the void. 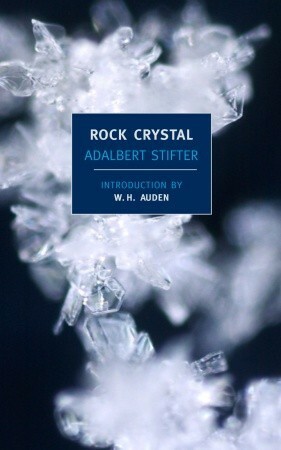 Adalbert Stifter's rapt and enigmatic tale, beautifully translated by Elizabeth Mayer and Marianne Moore, explores what can be found between Christmas Eve and Christmas Day—or on any night of the year. A rather bland fable with stiff characterization and superb landscape descriptions. The story is as cloying as a Thomas Kinkade painting, but the long beautiful passages about the ice fields are hymns. For scenery description, I'd give this 5 stars, unfortunately there is also a story. A brother and sister visit their grandparents through the woods (and around a glacier, I mean, this is the Alps) and get stranded in the ice on the way back home.The sister, Sanna, only says "Yes" to her brother, which drove me bonkers. The parents should have known better, the grandparents should have known better, after all they all have lived there for generations. At least they had a speedy rescue method. A seemingly simple story of two children walking home from a visit to their grandmother grows in scope and meaning as one thinks about it. Great descriptive writing from observations of landscapes and weather to human quirks and a touch of humor. Warning: The introduction by W.H. Auden (and even the back cover) have spoilers. with an introduction by w.h. auden, you imagine you're going to be in for a certain clarity of prose and you're right. this is a short and very simple novella about two kids lost in the mountains during a storm on christmas eve. you can read it in about an hour and it will be an hour well spent. the translation is musical and very, very fluid. don't read the intro til afterward, though, AS IT GIVES EVERYTHING AWAY.